June | 2005 | That Mall is sick and that Store is dead! A flash intensive photo album. Dixie Square Mall must have looked like this in 1983. It looks like that movie theater closed down pretty suddenly. Like the corporation just came in and told all the employees to leave. 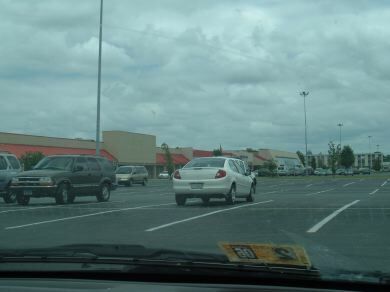 On my birthday this past Monday a friend and I went to go shopping in one of my childhood shopping centers – Riverdale Shopping Center in Hampton, VA. It’s two (out of three) anchors were still vacant, and they’ve been for almost 10 years! The Hills closed first in January of 1997 when I was in the 8th grade and 13 years old. I recently gave an article about the store closing and a photo of the building in its Hills days to the man who runs the hillstores.com. Two days after that article was ran in the paper, the store was closed. They didn’t even have a going out of business sale. The Farmer Jack was next to go in 1998. From as long as I can remember to 1997, the store was a Super Fresh, but in the late 1990’s the Super Freshes out here were transformed into Farmer Jacks. They were only open for a year, and all the Farmer Jacks in the area were shut down. It’s a shame another grocery store hasn’t moved in, I mean its a pretty funky looking building. I guess because all people in Hampton want are Food Lions. 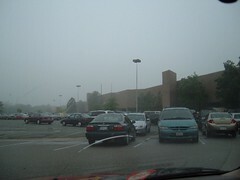 Newspaper photo of the abandoned Newport News location. 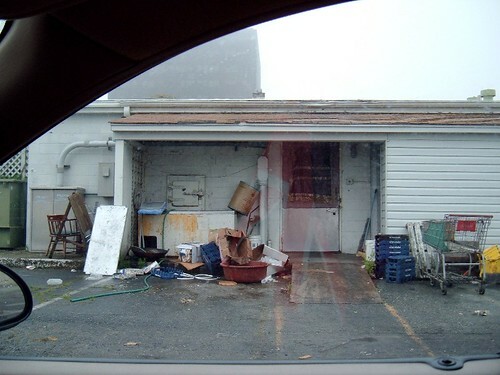 I sent these photos to the man who runs Orange Roof, Rich and he was kind enough to put them on his site. Yay! 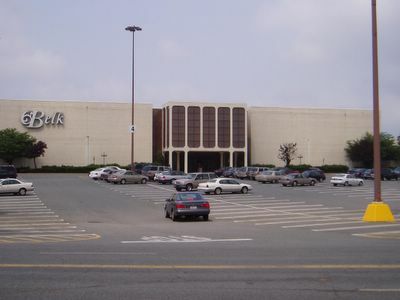 Yesterday I went driving around Newport News, Va (near my hometown of Hampton, VA) and I drove by my childhood mall –Newmarket North (1975-1990) / Newmarket Fair (1990- 1999)/ Netcenter (1999-present) . I just always call it “Newmarket Fair”. (mall bio I found off of finditva.com 2 months ago. This place stopped being a mall in 1999 (but it had died around 1990 when anchor Miller & Rhoads closed), and now (expect for the Sears and Piccaddily Cafeteria) it is all offices. 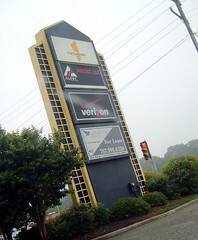 Verizon/Fanueil Group has the former Miller & Rhoads (I applied there in 2002 but failed the math test–good riddance! Every time I went to the place for an interview/open house it just looked like a horrible place to work at), Northrop Gruman has the former Leggetts, and Sears is still around (I assume Sears is still around because its the only one in the area, and they can’t find another huge building to move into) . I drove by the former mall entrances. The first floor still looks the way I last saw it in 1998-ish. It seems that around the mall entrance for Sears, regular joes can still enter. I’m not sure about the other former mall entrances. I think I might bribe my friend Melissa into going back over there on my birthday soon. Newmarket’s was brick though, and the facade was more orange-y. And the building was narrower. I hope to take photos of Newmarket/Netcenter again in a few weeks. Hopefully the weather will be better, and there won’t be that many employees out on their smoke breaks blocking the entrances.